Team Hawaii takes three Gold Medals: Josh Moniz (Boys Under-18), Tatiana Weston-Webb (Girls Under-18), Mahina Maeda (Girls Under-16). Australia’s Jacob Wilcox wins Boys Under-16. Following an amazing Final Day of great waves and exciting surfing performances, the 2013 DAKINE ISA World Junior Surfing Championship Presented by Billabong officially closed. Team Australia is the new ISA World Junior Surfing Championship Gold Medal Team and winners of the Team Champion Trophy. In the individual divisions, Hawaii’s Josh Moniz won the Boys Under-18, Hawaii’s Tatiana Weston-Webb won the Girls Under-18, Australia’s Jacob Wilcox won the Boys Under-16, and Hawaii’s Mahina Maeda won the Girls Under-16 in the incredible waves at Playa Jiquiliste. After a week full of excellent waves and conditions, the final day did not disappoint. The surf was in the waist to chest-high range with perfect offshore winds all day long, providing great waves for the surfers to perform at their highest level. The first final in the water was the Girls Under-16, where Hawaii’s Mahina Maeda, posted the best total heat score of the whole event, 19.16, earning the Gold Medal and World Championship. The Silver Medal went to Tahiti’s Karelle Poppke (13.27), the Bronze to Hwaii’s Dax McGill (10.57) and the Copper to USA’s Frankie Harrer (4.86). Up next was the Boys Under-16 Grand Final. Australia’s Jacob Wilcox won the Gold, earning 14.90 points, in a very close final against Silver Medalist Leonardo Fioravanti (14.73) from Italy. The Bronze went to Jake Marshall (12.20) from USA and the Copper to Reo Inaba (11.76) from Japan. Hawaii’s Tatiana Weston-Webb, continued her dominance, as demonstrated all week, into the Girls Under-18 Final. With another great performance, Weston-Webb won the Gold Medal. The Hawaiian, earning 15.50, defeated Silver Medalist Stephanie Single (AUS,12.10), Bronze Medalist Nikki Veisins (USA, 11.07) and Copper Medalist Chelsea Tuach (BAR, 9.17). In the Boys Under-18 Final, Hawaii’s Josh Moniz won the Gold after posting two big scores at the beginning of the Final, a 7.00 and 7.43, for a total of 14.43. Australia’s Soli Bailey followed closely, but couldn’t find a wave to advance over Moniz, earning 14.40 and the Silver Medal. Andy Criere, from France, won the Bronze Medal, finishing third with 10.84 and Australia’s Luke Hynd won the Copper Medal placing fourth with 5.70. 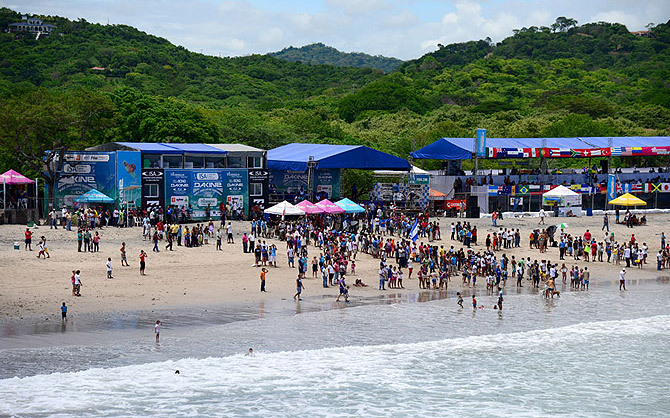 The last event of the 2013 DAKINE ISA World Junior Surfing Championship was the exciting ISA Aloha Cup, a tag-team competition, with the participation of the 7 best countries from last year’s ISA World Junior Surfing Championship (Australia, Brazil, France, Hawaii, Japan, Peru and USA) along with the local team, Nicaragua. It is important to note that Nicaragua was fielding its first ever Junior Team in ISA competition. After two semifinals where four of the eight teams advance, the Grand Final featured Australia, Japan, Peru and USA. Team Japan won the Gold Medal exhibiting a smart strategy and displaying high-level surfing skills. Japan defeated USA (Silver), Peru (Bronze) and Australia (Copper). Two special events took place today. First was a presentation from the people of Tola, which is region that includes Playa Jiquiliste, to ISA President Aguerre. Community leaders gathered and delivered a special gift in appreciation of the ISA coming to their city. Part of the presentation was the telling of the traditional story called “La Novia de Tola” or “Tola’s Girlfriend,” which has turned into mythical story about a social scandal between a couple. The second special event was the “Tola Groms Expression Session.” Team Nicaragua’s Captain, Jackson Obando, who was born and lives in Tola, surfed a 15-minute heat alongside four of Tola’s best young surfers. The local surfers put on a great show for the nearly fifteen hundred local spectators and competitors on the beach. When the surfing competition concluded, the Closing Ceremony took place to officially close the 2013 DAKINE ISA World Junior Surfing Championship and award the team trophies and individual medals.